When buying luggage you shouldn’t choose based on what looks nicest, you should choose bags that are going to stand out on that airport baggage carousel. And when was the last time you saw a miniature Batmobile circling the carousel after a flight? It’s just too bad this suitcase is only designed for kids. 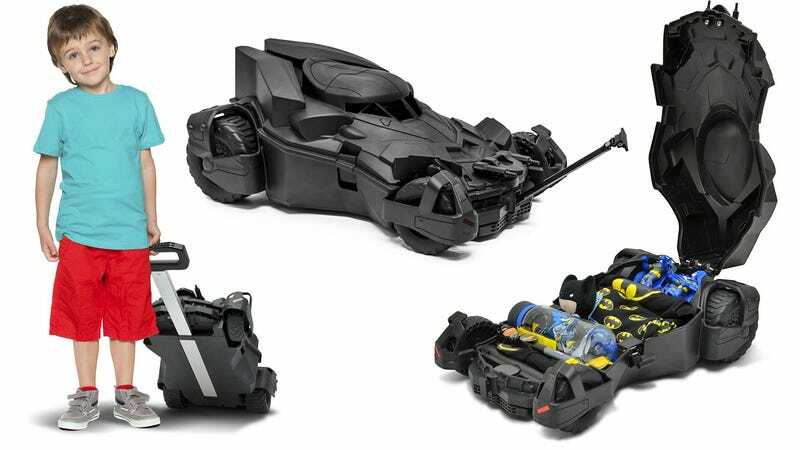 Based off the new Batmobile that will be appearing in the upcoming Batman v Superman: Dawn of Justice movie, this replica is surprisingly detailed for a suitcase. It even has a miniature set of machine guns on the front, which, admittedly, might actually be a hassle when dealing with over-zealous airport security agents. All four of the Batmobile bag’s wheels roll, allowing it to be dragged upright like a traditional two-wheeled suitcase using an extending handle, or pulled around like a car on all four tires using a retractable tow. Racing down an airport concourse to catch your plane would be far less stressful with one of these dragging behind you. The problem? Here’s how much storage you’ll find inside this suitcase. If you typically only travel with a water bottle, some Batman pajamas, and a couple of action figures, then by all means drop $100 on this Batmobile suitcase once it’s officially available at the end of May. But if you need more storage space, you might want to only consider this for your carry-on item, until they release one that’s large enough for grownups to use.